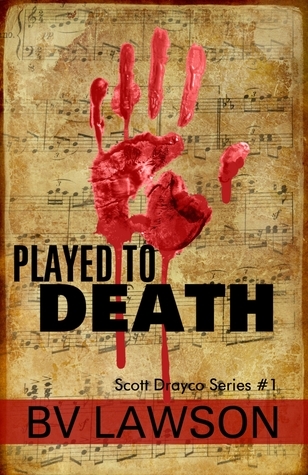 Played to Death is a well-plotted mystery with wonderfully drawn characters. I loved Scott Drayco because so many different and intriguing aspects of his character were introduced in the story that I kept wanting to know more about him. Lawson never directly described him, instead she revealed tiny bits of information throughout the story. Instead of describing him as tall, she tells us he ‘folded himself into the car’ – a very visual and telling description. She does the same with the rest of the quirky, compelling cast. In mysteries, it’s difficult to find a balance between a plot that is complex enough to pull the reader in and get her to try to solve the puzzle, and a plot that quickly becomes convoluted and leaves the reader feeling lost in the abundance of indices. Lawson strikes the perfect balance that keeps the crime puzzle captivating, but not overwhelming. I managed to guess the perpetrator towards the end, but I wasn’t certain to the very last chapter. Lawson uses the gothic features of the abandoned Opera House to great effect, creating an atmospheric background for the crimes and the solving of them, all of it accompanied with music that’s almost like another character. The pace never sagged and it kept me enthralled throughout despite a few typos in the text. Alongside the current murder mystery, Lawson also managed to include details of Drayco’s previous case in which two children died, shedding more light on his character and background, and intertwine it all with an unsolved murder from decades ago. It all worked together to form an intricate plot and complex characters with strong motivations. I’m very excited for the next novel in the series. With the main character now familiar, I’m sure the second one will be an even better adventure.